Sutton Coldfield Rectors of medieval times lived in a huge rambling timber-framed building of twenty-two bays, situated in what is now Rectory Park. This ancient Rectory House was not to the taste of the incumbent in 1701; he had a fine new building of brick in the Queen Anne style built, and the old rectory demolished. When this rector, Mr. John Riland, died in 1720 he was succeeded by his son Richard Riland, Rector from 1720 to 1757. The anonymous writer of a 1763 history of Sutton gives a description of the Rectory, which he says is set in “fertile glebe land of about 50 acres, over which is a pretty prospect of the town, thro’ a visto of lime trees, planted by the late most worthy Rector.” Richard Riland was succeeded as Rector in 1757 by his son Richard Bisse Riland, who commissioned a survey of the glebe lands from the local surveyor, John Snape. As well as a plan and elevation of the house, the survey shows the Avenue extending from the Rectory door; Snape’s plan shows over a hundred trees in the avenue. Mr. Riland Bedford, who was Rector from 1822-43, was another tree-lover. His son wrote of him “The formation of roads and the planting of trees on the waste were actively promoted by the Rector, Mr.Bedford, who possessed great practical knowledge, especially on the latter of these subjects, on which he had written a short treatise”. (“The Midland Forester”, by a woodman of Arden, 1829, 51 pages, price sixpence.) He had plenty of scope for tree-planting as the commons were being enclosed at the time with many miles of new hedges with timber trees every fifteen yards. This Rector may also have been responsible for planting the row of lime trees on the bank of the (then) new turnpike road, some of which still flourish along the Parade in front of Marks and Spencers. After 1850 the character of the town was changing and the avenue of trees was threatened by development as well as the occasional death of one of the 150-year old trees, but in 1877 the Rector rose again to its defence. A railway company planned a line that followed the boundary between Good Hope Hospital and the cemetery before crossing Rectory Park to the New Hall Valley. Riland Bedford petitioned Parliament, saying “That the glebe land is attached to the Rectory House, from which there is a fine avenue of old lime trees more than 500 yards in length, along which the Rectory House commands a beautiful prospect, but if the proposed railway be carried as proposed across the said avenue by an embankment of about sixteen feet high, such view will be obstructed, and part of the said avenue destroyed”. There is nothing left now of the rectory, which stood near the children’s playground in Rectory Park, but two or three of the old lime trees are still there. 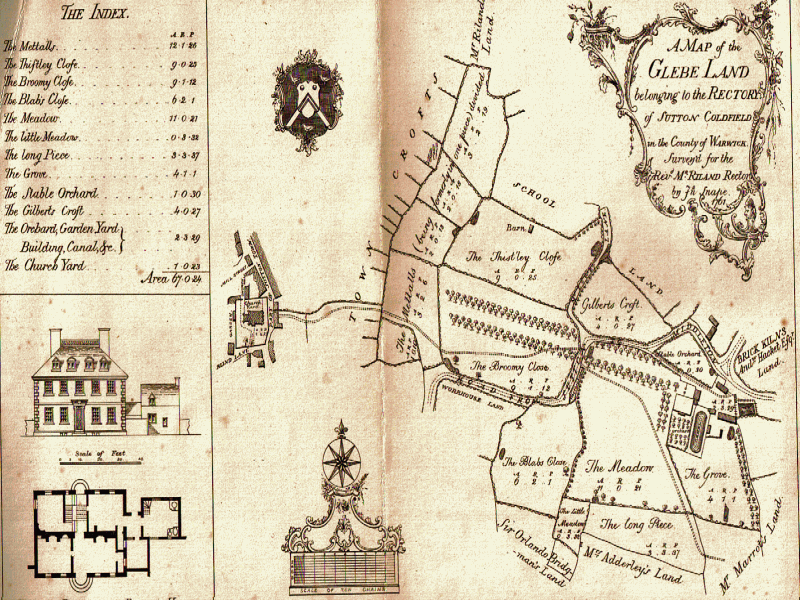 Detail of Snape’s 1761 plan of the Glebe Lands, showing the avenue of lime trees. 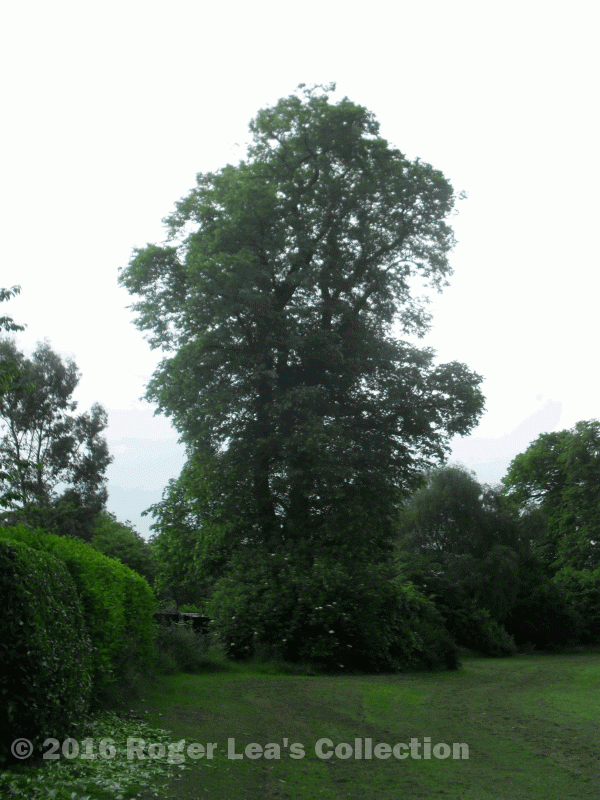 An old lime tree in Rectory Park, a rare survivor of the grand avenue.